It was pet friendly and the staff was great. Our corner room was under a street lamp and was bright even with the shades pulled. Also, our neighbors were horrible and loud all night. Again, location, staff and breakfast were great. Excellent outdoor heated pool and hot tub. Great breakfast. Beautful river views. I like the historical facts about the property and the info they had available. 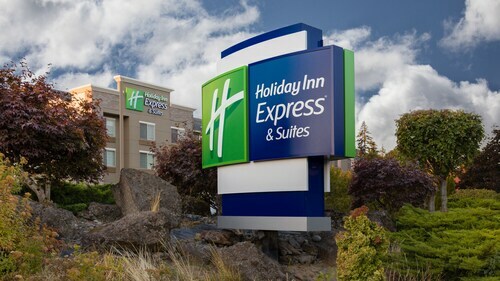 Great hotel close to Hood River Downtown. The front desk staff was very friendly. Hotel room are spacious with balcony, great comfy bed and clean bathroom. Will stay again! Central location to downtown. Location was clean and quiet. Staff was professional. Good location, very clean and comfortable with ample parking. So you're thinking about a getaway to Hood River? If you want a place to lay your head that's located close to Hood River attractions, use Orbitz to pick your travel dates, and then presto! Review the list of hotels and other accommodations to find those that are near everything you want to see and do. We make it easy to find a convenient flight into Portland, OR (PDX-Portland Intl. ), which is 52.6 mi (84.6 km) from the heart of the city. Find your ideal flight in a flash by using the filters on our site to narrow down your search. Orbitz can help you find lodging that has all the amenities you want in a hotel, whether that's free parking, a kitchen, or a swimming pool. Go for a swim when you stay at one of these Hood River properties, liked for their pools. What's the Weather Like in Hood River?